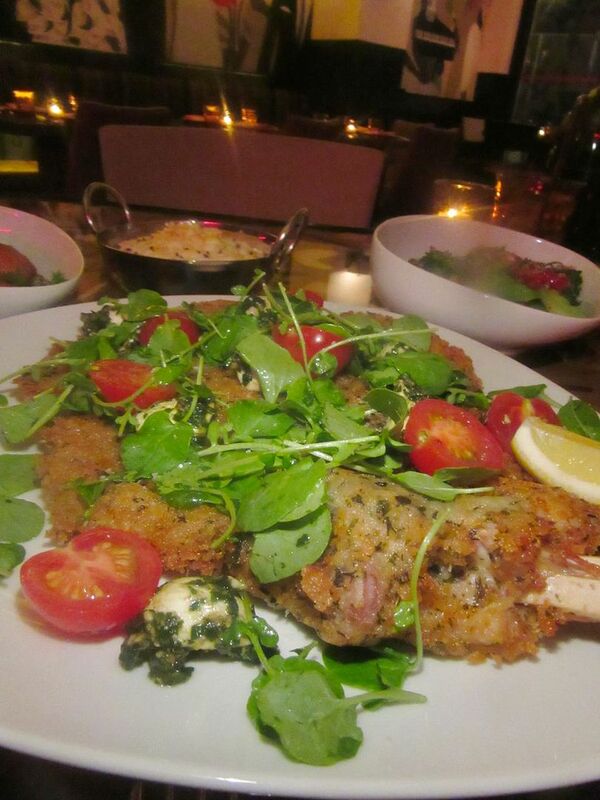 The $65 bone-in breaded veal chop is a supper for two that comes with two “accoutrements.” Get carrots. It looks like the partners invested loads of time and cash in infrastructure at 33 Greenwich -– splashy murals, scarlet neon, an exterior crown. I wonder why they didn’t take another five minutes to come up with a catchy name. “Southern style and creole” is what caught my eye in the opening announcement. “Let’s go to 33 Greenwich,” I email my friend. 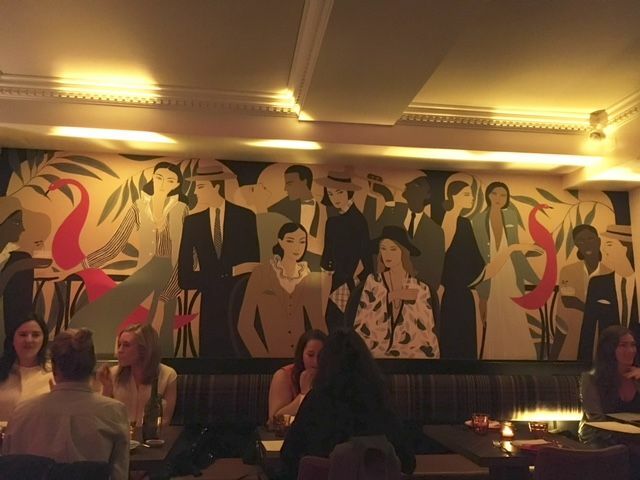 Kelly Beeman did the murals, a vision of the eclectic crowd 33 Greenwich hopes for. “What’s the name of the place?” she asks. “33 Greenwich is the name and 33 Greenwich Avenue is the address,” I email back, a bit confused myself. Greenwich Avenue in the West Village is one of those streets where restaurants bloom and fade. Or is that Greenwich Street? I need to look it up on the map every time. 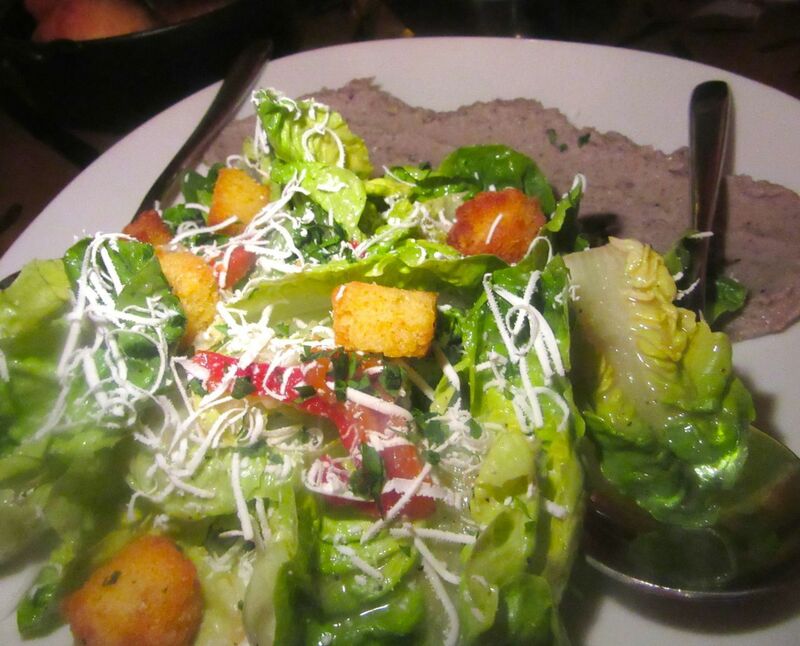 L’il gem lettuce is tossed with smoked black-eyed peas, cornbread croutons and ricotta salata. Arriving that first week, I did not expect to be quite so enamored with the unusually lush and crusty green tomatoes, a lusty little gem salad with cornbread croutons, and a mountain of moist and crispy fried chicken jeweled with pickled watermelon rinds. I am stunned to find this crumble-topped sour cherry tart -- the pie I dream of. And sour cherry pie. 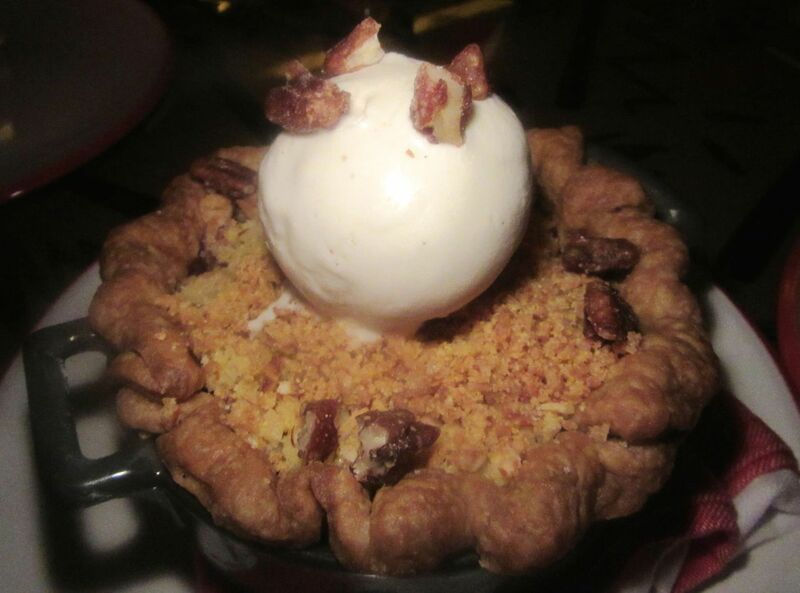 It comes in a bowl, not too sweet, with a crumb crust. Could someone be reading my mind? How I long for sour cherry pie. Chef Anne Thornton emerges from the kitchen to collect our comments. 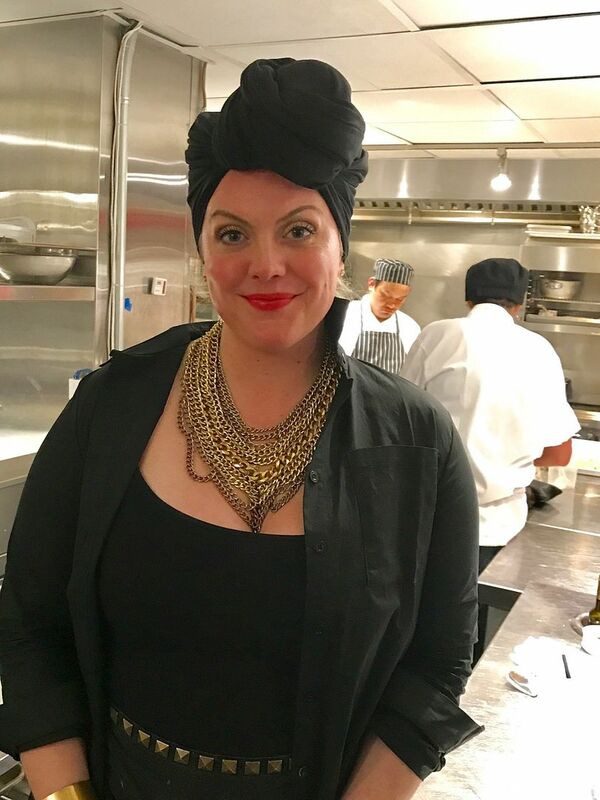 She’s jeweled too, draped in a black turban with a cascade of silver chains at the neck of her black chef’s coat, black Converse sneakers, mascara and eye shadow. 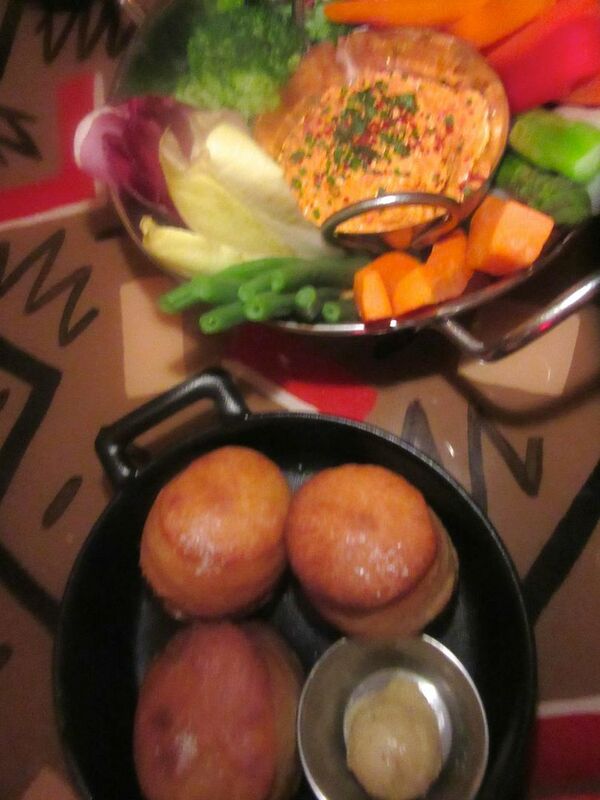 Biscuits with peppered honey butter and pimento cheese surrounded by crudités are the way to start. Certainly, we’ve eaten more than enough to get her attention. 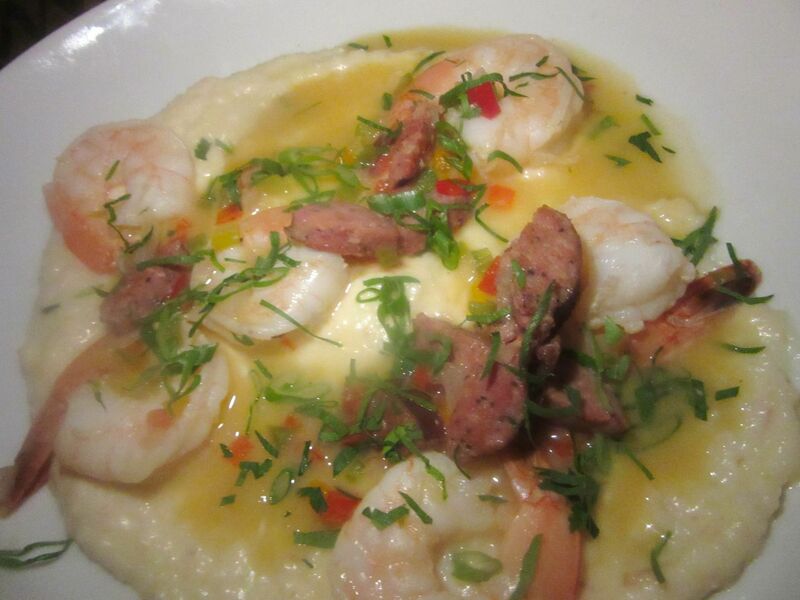 Made a big dent in the menu, from the biscuits with peppered honey butter (maybe not the lightest or flakiest ever, but I do love biscuits) and pimento cheese with crudités, to the shrimp and grits with batons of spicy Andouille sausage. “Georgia ice cream” is another name for grits, she explains. Hers are especially complex and rich because she adds Gouda. She’s always adding something. The secret of the exceptional chicken, posted under “Suppers for Two” (but easily enough for four at $55), is brining it in tea, then buttermilk with barbeque spices. Mustard seeds add texture and blast to the crust. There’s herbed buttermilk under the panko-crumbed fried green tomato batter too, as well as in the sauce you want to pour on and lick off your fingers. 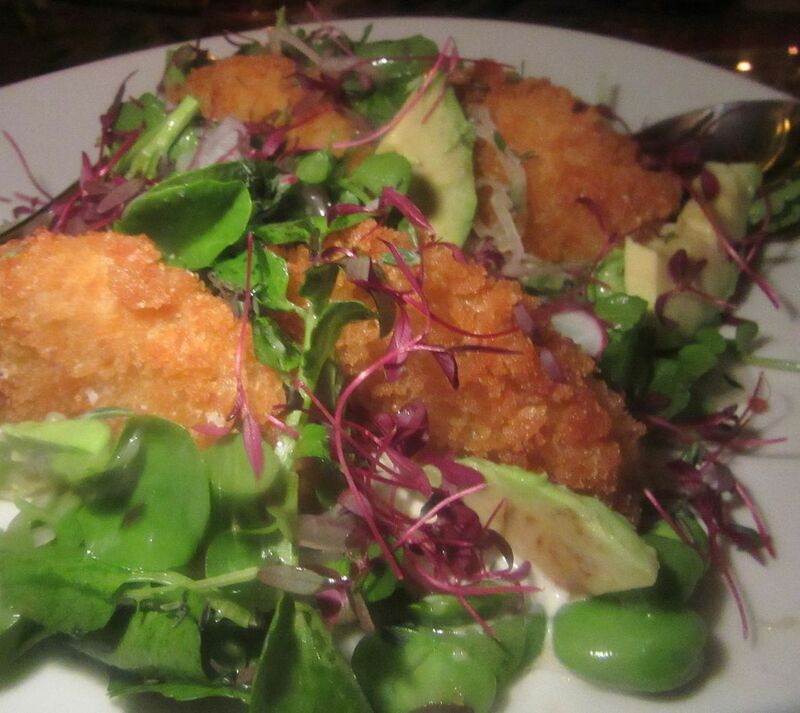 The spring beans and radishes are on the plate because vegetables are good for you. Candied watermelon rind is scattered through the mountain of crusty fried chicken – enough for four. 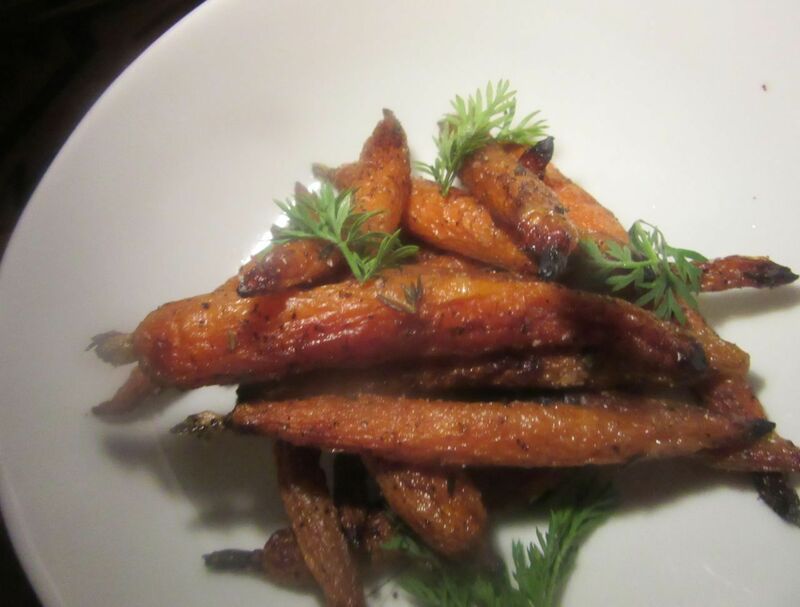 Why are the carrots so good? They’re cooked in the rotisserie drippings. Managing partner Danny Volk, an operator at Catch before opening Upsider on Second Avenue, worked with the creative team Kizmet here. He credits them with the design, the branding, the cute menu font, and everything else. Including the name (Greenwich, Connecticut lends cachet, he tells me when I ask why the redundancy). 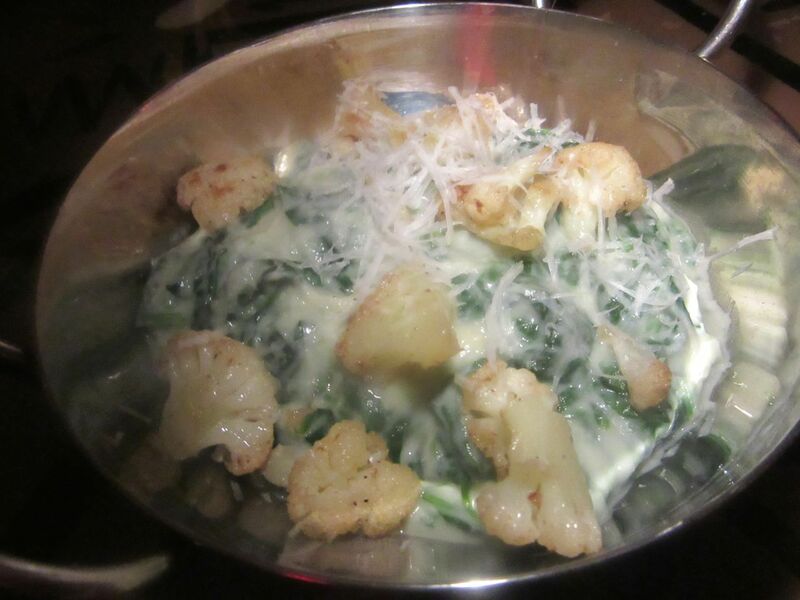 The cauliflower creamed spinach sounds more exotic than it actually is. Kizmet partners Kelly Framel and Zachary Lynd collected the art, works by artist Joel Mesler, drag queen Steve Willis, collage artist Miguel Rangel and muralist Kelly Beeman. 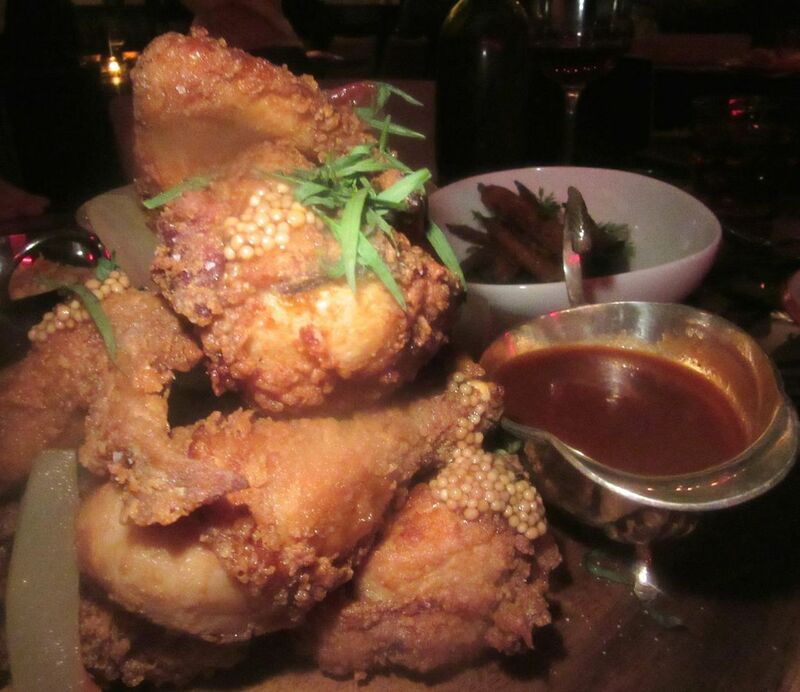 Framel knew the chef from her chicken potpie at Waverly Inn and from Moby’s vegan spot in California. Maple syrup and a big dose of cream sweeten the sweet potato puree. Volk says he worried that Southern food would be fried and heavy. He was right. A lot is fried and wantonly rich. The seared Arctic char comes with beurre blanc. Marcona almonds and goat cheese garnish the rotisserie chicken. The dry aged meatloaf burger is layered with caramelized onion and tomato jam. 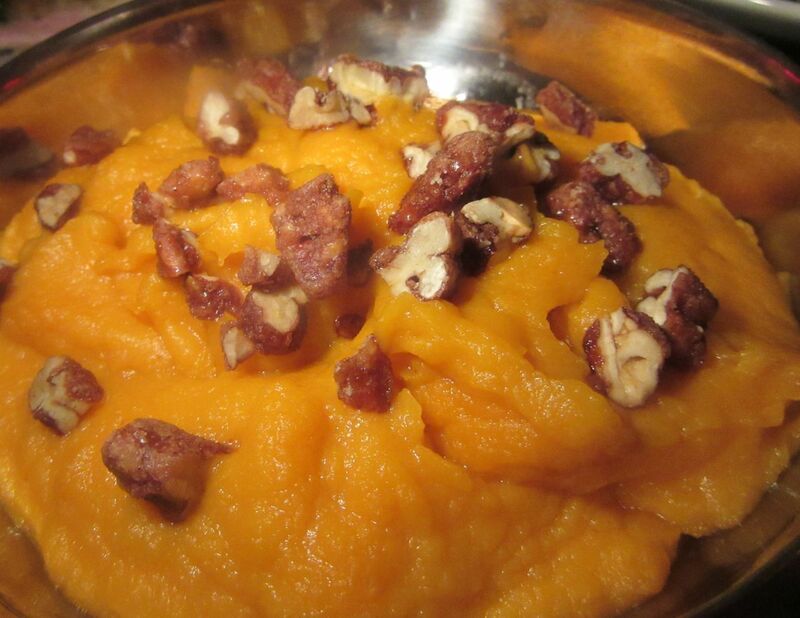 Maple syrup-dosed sweet potato puree is larded with cream. But the chef has her limits. “No ham hocks ever,” she promises. 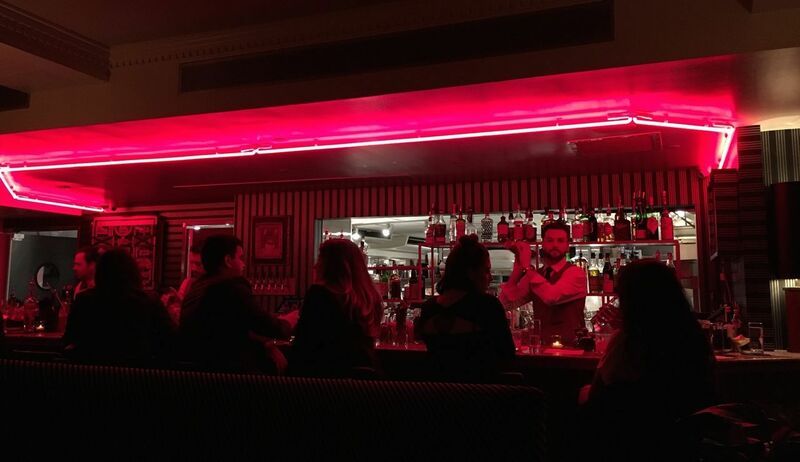 You can see the action in the open kitchen through the neon wrapped bar. It’s Friday, first week, and the place is already full, tables turning. Earlier, young families, lots of millennials in caucus later, like me leaving with their leftovers. The sound-track, favorites of Volk and investor Brian Fitterer, gets hotter as the strollers roll out. 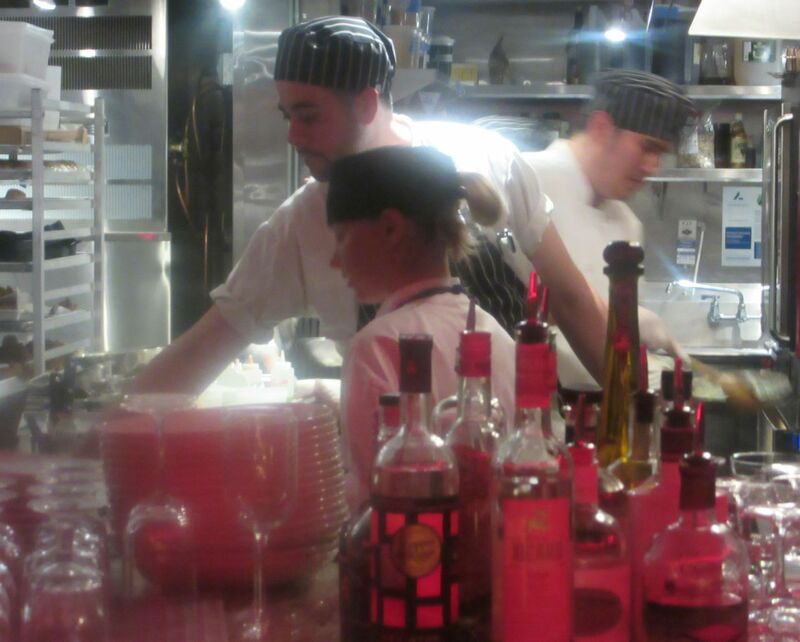 I caught this closeup of the kitchen crew keeping up with a full house on Friday evening. I decide I need to return Monday to taste more for this first look. It’s drizzling. The place is almost empty. I won’t deny my companions those fried green tomatoes or the pimento cheese with crudités. The biscuits arrive. Buttermilk basting and a side of buttermilk sauce make exceptionally rich fried green tomatoes.